Two words we are seeing on massage product labels more often these days are ‘organic’ and ‘natural.’ As customers are becoming more conscious of environmental toxins and damage, they are looking for products that are produced using less toxic materials and in more environmentally-friendly ways. So, if a product is labeled ‘organic’ or ‘natural’ does that mean it is toxic free and environmentally friendly? If so, what is the difference between the two words? When a label says ‘natural’ or ‘organic’ (or both), it usually means the product is made or with less synthetic or highly-processed substances than standard options. Of course, for the hundreds of different massage supplies available, this is not always possible. However, we can expect a product which tells us it is either ‘natural’ or ‘organic,’ to be produced with fewer pesticides, petrochemicals, artificial colors, preservatives, or other processed chemicals. Why are some products ‘organic’ and others ‘natural’? Simply put, organic producers specifically avoid using synthetic and processed chemicals when producing their goods. For crops, a conventional grower may spray pesticides to reduce pests and disease on the crops, while an organic grower may use beneficial insects, hand removal, or traps to reduce pests and disease. Sometimes, organic producers seek to have their products ‘certified organic’ and have a logo added to their label. ‘Natural’ products may have similar production processes to organic products, but not always. Sometimes, they are made with a mix of organic and non-organic materials so ‘natural’ is used instead of ‘organic’. ‘Natural’ may also refer to the materials used in the product - a massage table cover might be labeled ‘made with all-natural fibers’ because it is made only of cotton, with no artificial fibers such as nylon or polyester. 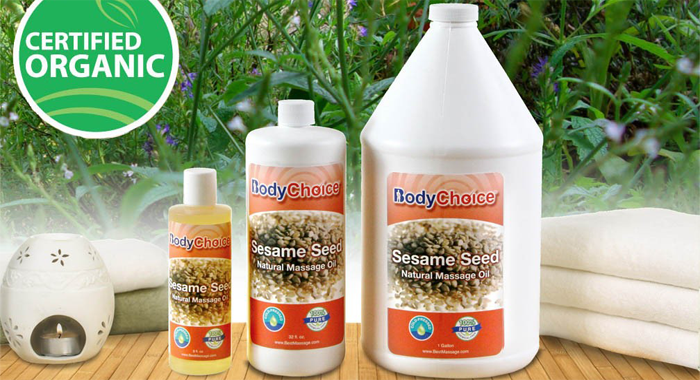 A good example of a line of products in the BestMassage.com warehouse that are regularly marked with these words is the popular BodyChoice range of massage oils. All of these are either organic (certified organic) or natural, in which case they are still made with fewer synthetic ingredients. Don’t forget that just because a product doesn’t have ‘organic’ or ‘natural’ on the label doesn’t necessarily mean that it is toxic, or bad for the environment. After all, it would be very difficult to have a certified organic line of massage tables!